Of course, if it were “just that,” it’s frustrating because the actual matches WWE builds around should be considered part of what’s “entertaining” also. This idea of labelling The Authority dancing with The New Day as “Entertainment” suggests that “Wrestling” is something other than “Entertainment.” As if WWE stand for “World of Wrestling and Entertainment.” Like McDonalds is home to “Hamburgers and French Fries.” But imagine if McDonald’s advertised that they were home to “Hamburgers and Food,” which indicates that they don’t consider their hamburgers to actually be “food.” You have to believe in the core of what your chosen business sells or else you shouldn’t be in that business. I’ve heard many people say that you “need entertainment mixed in with the wrestling matches to keep people engaged.” That approach has contributed to the demise of wrestling companies over the years because any promotion that thinks wrestling isn’t ultimately the most entertaining aspect of the business they are involved in is doomed to fail. You can’t succeed as a pro wrestling company if you don’t think pro wrestling is entertaining any more than a fast food chain can succeed if it markets its top selling item as something other than food. He might also have Tweeted it because he thinks black people dancing is entertaining, just like he thought R-Truth joking gregariously about shoplifting and being a bad student was entertaining, and The Godfather saying “pimping ain’t easy” was entertaining, and naming a team of two black men Cryme Tyme was entertaining, and on and on. He also might have been sending a message to detractors within the company that it was a good idea to have two (most often) heel authority figures smiling and dancing with a popular tag team act who lately are getting more and more cheers for their over-the-top cheerfulness and exuberance no matter what comes their way. Perhaps that person was Triple H, who did not look the least bit enthusiastic or engaged in that segment. And for good reason. I’ve been told there are times Triple H has entered Vince McMahon’s office with his chest puffed out ready to make his case for or against something, and walks out looking frustrated and beaten down. Maybe this is one of those situations where he disagreed with Vince, and Vince wanted to establish who still runs the place. When the “entertainment” you present completely contradicts the constitution of the character you are featuring in that situation, your “entertainment” becomes counter-productive. Talking sense into Vince McMahon, a 70 year old one-time billionaire (who is still filthy rich) who is going to do what he finds fun at every opportunity regardless of its merits in regards to the health of his company because he is convinced those two are one in the same (or close enough to not matter), is a losing battle. As multiple ex-WWE writers have told me on the PWTorch Livecast in recent years, the job of being a WWE creative team member is to write for an audience of one – Vince McMahon. Your job isn’t to draw ratings or get wrestlers over or sell tickets. Your job is to entertain Vince McMahon. 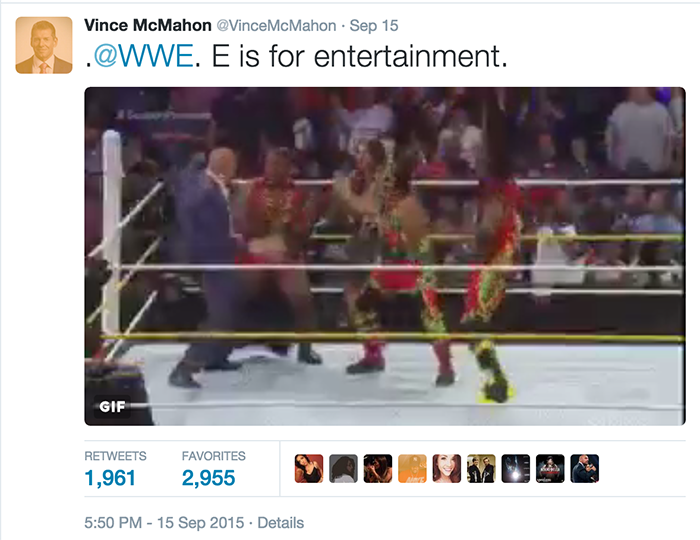 So if someone behind the scenes disputed the wisdom of having Triple H and Stephane dance with New Day, choosing to show that gif as one of his infrequent Tweets sent a message that he’s the boss and what he said worked because, dammit, “E is for Entertainment! Maybe it was all of the above. The fact that one of his infrequent Tweets highlighted that moment on Raw and included the stamp that it was “Entertaining” says something, though, and I think it’s a window into an attitude and vision that is hurting WWE. NOTE: Bruce Mitchell & I discussed this on the 94 minute VIP Bruce Mitchell Audio Show posted earlier this weekend. Bruce Mitchell & Travis Byrant discussed this on Friday’s PWTorch Livecast, also.